Both might have put their basketball shorts on one leg at a time, but shortly after that the distinction between the Wilsonville and St. Helens girls basketball teams became evident Tuesday, Jan. 8. "You see it right away, in warmups and when they take the court," St. Helens coach Michael Fendall said of the Wildcats. "They're really crisp, and they have an air about them, a confidence in what they're doing." All that plus a bunch of good shooters and a couple of potent post players with good size. The Wildcats used all of the above to show the host Lions why they are ranked No. 1 in Class 5A, scoring the first 11 points in an 85-48 victory at St. Helens to open the Northwest Oregon Conference season. "They really hit us in the mouth," Fendall said. Wilsonville led 19-6 after one quarter and 47-16 at the half. "I felt like we were paddling, and then they just took off on us, but that's what great teams can do," Fendall said. "I wouldn't be surprised if they could compete with the best 6A teams in the state." Cydney Gutridge, a 5-9 senior guard, led the Wildcats with 21 points. 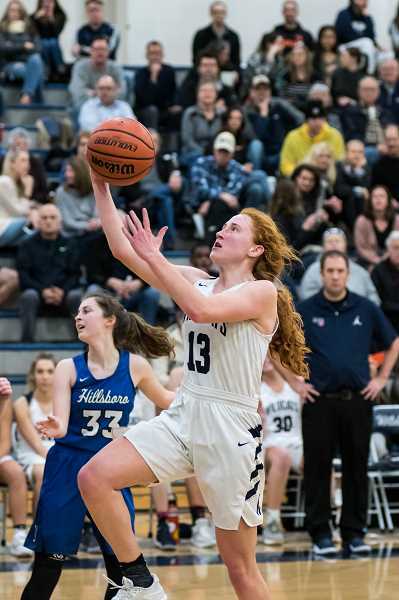 Wilsonville's scoring balance showed, though, with senior Hannah McKinney and sophomore Emilia Bishop, both 6-2, getting 12 and 10 points, respectively, on the inside. The Wildcats had two other players finish in double figures, with 5-7 senior wing Reese Timm netting 11 points and 5-9 sophomore guard Sydney Burns adding 10. Wilsonville made seven of its nine 3s in the first half, four of them by Gutridge. "We shot the ball really well," said Wildcats coach Justin Duke, whose club has won six in a row. "We still have some work to do on defense, but all in all it's fun to watch these girls play." 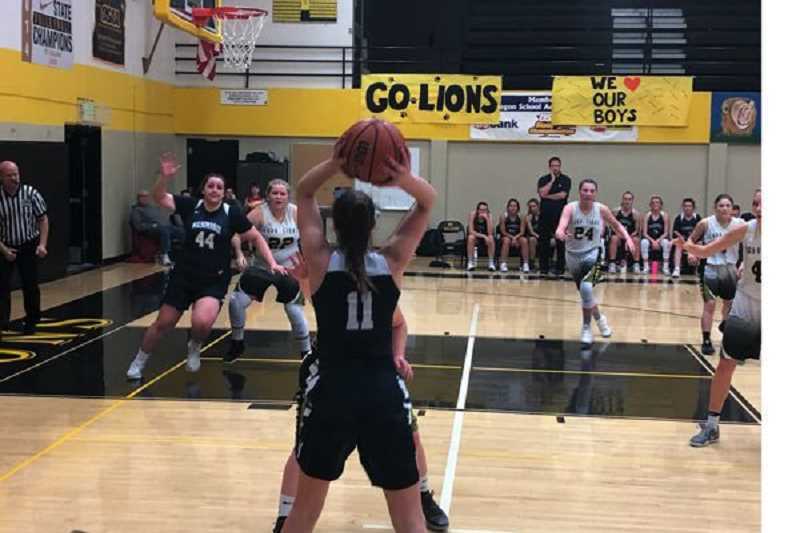 St. Helens countered with its premier player, junior Maddie Holm, ringing up 28 points, including 11 in the third quarter, which was the Lions' best. St. Helens played better at both ends of the court in the second half, and that gave the Lions something of an upbeat feel despite the loss. "I felt a lot better about the second half," said Lions senior point guard Emelia Paullus, who scored all 14 of her points after intermission, sinking four 3s. "We were standing around too much on offense, and if Maddie is the only one taking it to the hoop, it's hard," Paullus said. "I felt like I needed to score some points to try to help out. I saw the open shots (in the second half) and I was like 'I need to take these instead of passing them up.'" Holm also finished with a team-high 12 rebounds. Duke said the game plan was "just to defend her the best we could. When she doesn't have the ball, we want to deny it so she never gets it back. But she's such a good player, we knew it was going to be tough to hold her down. She's got to be one of the best players in the state, so it's fun to watch her, too." Wilsonville had its 11-0 lead after 3 1/2 minutes. Holm got all six of St. Helens' points in the first quarter but wasn't able to score until the four-minute mark. She wound up with the Lions' first 10 points. McKayla Foster was the first other St. Helens player to score, hitting an 8-footer with 2:56 left in the first half. No Lion other than Holm and Paullus finished the game with more than two points. 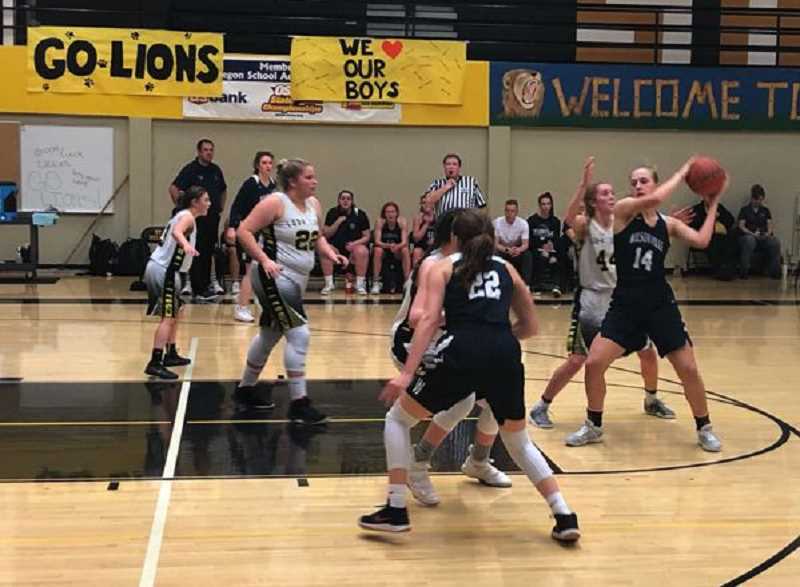 The Lions have dropped their last three games, and they had scored only 33 points in their most-recent outing, a 10-point loss at The Dalles Jan. 4. The Lions will take a 6-5 overall record into Friday's 5:45 p.m. home game against Scappoose. Wilsonville, meanwhile, is a perhaps misleading 8-4 — its losses came to Skyview of Washington and to three California teams in a tournament at Orinda, Calif. The Wildcats swung the ball efficiently on offense and got on a roll early. "Our kids do a nice job of sharing the ball," Duke said. "They know we've got 10 really good players, so they don't need to force anything. And it becomes more fun when you can share the ball." McKinney said the Wildcats were prepared to play well by the time they got off the bus at St. Helens. "We haven't always played our best here, but I think the bus ride really prepared us, and we were ready to come play," she said. "We all came out really excited. Our bench was really up. It was a great start." The No. 1 ranking — in both the 5A coaches' poll and by the Oregon School Activities Association computers — doesn't seem to have affected the Wildcats one way or another. "It definitely puts a huge target on our back. That's the spot everyone's looking to get," McKinney said. "But I think we're handling it pretty well. We're staying humble and just coming out to play, like No. 1 doesn't matter right now." One reason it doesn't is because No. 2, La Salle Prep, is in the same league and is on Wilsonville's schedule twice. The teams will meet Jan. 15 at La Salle Prep and Feb. 12 at Wilsonville. And even bigger games are likely to come in the postseason. "The girls know the big games are in front of us," Duke said. "We're hungry to get better. The kids have a lot of goals this year. So I think it's just a matter of us continuously building, game after game. We're on a pretty good path right now, and we want to keep it rolling." Wilsonville followed that performance up with a 77-53 victory over the Hillsboro Spartans (1-1 in NWOC play, 7-5 overall) on Friday, Jan. 11. Tanner Russ contributed to this story.